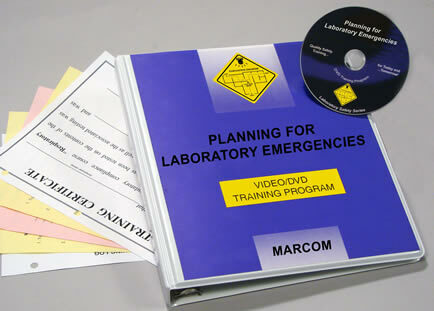 Description: MARCOM's "Planning for Laboratory Emergencies" Videotape Training Program discusses how to minimize damage and prevent injuries if a laboratory emergency should occur. A caustic acid hose has just erupted... an experiment has shown unexpected reactions... what should employees do to deal with these and other emergencies? Employees need to know when and how they should act in an emergency situation. Areas covered in the program include the emergency plan, types of emergencies, alarms and warning systems, contacting outside agencies, evacuation, fires, explosions and chemical spills, and more. The Videotape Program comes with a comprehensive Leader's Guide, reproducible Scheduling & Attendance Form, Employee Quiz, Training Certificate and Training Log. This Videotape Training Program is one of 12 in the “Elements of Safety” Laboratory Safety Training Series.